As the mother of seven (four children and three step-children) I’ve racked up countless hours watching kid movies, musicals, and theatrical productions (including several featuring furry muppets as well as those on ice), and plenty of other juvenile fare. I’ve seen princes and princesses, talking automobiles, animated animals, mermaids, superheroes, and monsters galore. And do you know what? I really haven’t hated it all! In fact, I’ve actually quite enjoyed most of these experiences. 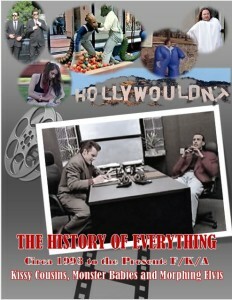 Despite what one might assume that for anyone beyond the pimple years would be cloying, banal, and beneath their age-grade – and consequently wouldn’t provide anything but time for a two-hour snooze – has instead become a vehicle for the entertainment industry that successfully brings out a grown-up’s inner child while concurrently providing joy to the little ones. Among them, one rather notable silver screen chap who managed to steal my heart was a perpetually cranky green ogre. That brings me to Pillow Talking’s most recent venture – Connecticut Repertory Theatre’s (CRT) production of Shrek The Musical, the 2008 extravaganza with music by Jeanine Tesori and book and lyrics by David Lindsay-Abaire. While I have never read William Steig’s 1990 book Shrek!, I have seen the 2001 DreamWorks’ film more times than I can count. Coincidentally, I also recently saw the documentary The Standbys which featured actor Ben Crawford, a standby for Brian d’Arcy James, who later assumed the title role at the end of the run for Broadway’s Shrek The Musical. Beyond that, I’d known little about the stage production. I will say, however, that going into it, my expectations were high for CRT – a fantastic venue we visit often, which features both seasoned Equity actors and incredibly talented University of Connecticut students. In a word, “The greatest fairy tale never told” is spectacular. Directed by Margarett Perry, it also is an edgy, zany, non-stop romp and altogether magical. With a large cast of exceptional performers, extraordinary puppetry, terrific costumes, and spot-on set design, CRT’s Shrek is a feast for the eyes and an unrelenting tickle to the funny bone. Unless you’ve been living in a swamp (and not the one situated a few miles outside of the Stepford-esque Kingdom of Duloc) you must know about the cantankerous yet loveable, bellyaching and belching green ogre who goes by the name of Shrek. The irascible colossus, who was banished to a life of solitude by his parents at the age of seven, resignedly prefers the company of no one, and purports to like it that way. This all changes when a few dozen unusual guests (Pinocchio, the Mad Hatter, the White Rabbit, the Ugly Duckling, the Big Bad Wolf, and the Three Little Pigs, just to name a few) land on his turf after a severely height-challenged dictator, Lord Farquaad, ejects them just because they are different (Freud would have a field day with his reaction formation defense mechanism). Shrek agrees to journey to Duloc to speak with the Napoleon syndrome-saddled screwball to help the band of oddballs reclaim their homes; his real motive, however, is so that he can just get them out of his swamp. Along the way, Shrek hooks up with Donkey, a sassy, hyperactive hoofer who would do anything to have a real friend, even one who openly rebuffs him. Once the two locate and have a chat with Farquaad, in exchange for the property deed they agree to rescue Princess Fiona from her tower (where she also was exiled by her parents at age seven) so that Farquaad may marry her and become king. This is where the real adventures and misadventures begin. The dazzling and ginormous cast all deserve hearty shout outs. Will Mann, a Broadway and national tour veteran, is phenomenal as the titular character. With his imposing stature, excellent vocals, and great comedic timing, he embodies the cranky Shrek. 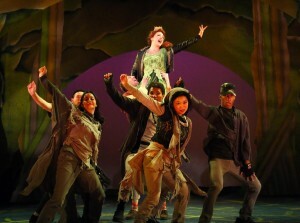 Songbird and Broadway/national tour maven Desi Oakley is captivating as she brings out both the beauty and angst of Princess Fiona’s unusual and torturous predicament. Scott Redmond, a UCONN BFA senior, as the stuck-like-glue, overenthusiastic sidekick Donkey is an outstanding physical actor who steals more than a few scenes. Mark Boyett, a seasoned Off-Broadway and regional theatre actor, is the one you love to hate as Lord Farquaad, and I hope he had some hefty knee pads for this run (or in his case, hobble)! 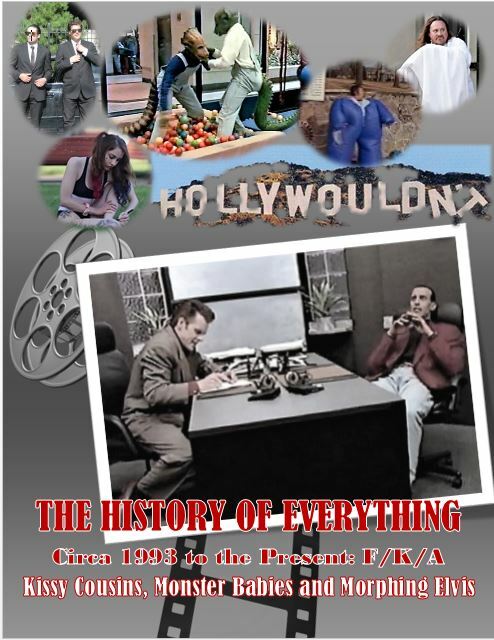 EACH and EVERY character contributed memorable moments to the production and without whom the wild and wacky couldn’t have been pulled off. There are NO small parts, so here goes: Sam Kebede as Gingy; Matthew Sorensen as Pinocchio; Valerie Badjan as Mama Bear and Dragon; Michael Bobenhausen as Papa Bear; Aaron Bantum as Baby Bear and Little Shrek; Bryce Michael Wood as Big Bad Wolf and Papa Ogre; Meredith Saran as White Rabbit and Mama Ogre; Arlene Bozich as Fairy Godmother; Perry Madison as Peter Pan; Rebekah Santiago Berger as Wicked Witch; Pearl Matteson as Ugly Duckling; Braley Degenhardt as Queen Lillian and Mad Hatter’ Tabatha Gayle as Humpty Dumpty; Gillian Rae Pardi as Elf and Young Fiona; Ryan Rudewicz as Pig 1 and Bishop; Nicholas Greika as Pig 2; Gavin McNicholl as Pig 3; Andrew Smith as Grumpy; Derrick Holmes as King Harold; Carly Polistina as Teen Fiona and Greeter; and Curtis Longfellow as Captain of the Guards, Thelonius, and Pied Piper. Many doubled also as the following: Captain’s Guards, Bobenhausen, Holmes, and Wood with Nick Nudler; Duloc Dancers, Santiago Berger, Degenhardt, Greika, Holmes, Matteson, McNicholl, Nudler, and Saran; Knights, Holmes, Nudler, Rudewicz, and Wood; Rats, Bantum, Santiago Berger, Madison, Matteson, and McNicholl; 3 Blind Mice, Santiago Berger, Matteson, and Gayle; and Puppeteers, Ed Ho, Nick Parks, and Noel Williams with Kebede and Sorensen. Shout outs also to Music Director John Pike, Choreographer Katie Johannigman, Lighting Designer Andrew Berardi, Scenic Designers Tim Brown and Morgan Dawn Golightly, Costume Designers Corey Brittain and Heather Lesieur, Dramaturg Molly Hamilton, Sound Designer Justin Graziani, Puppet Designer Zach Broome, Puppet Coach Bart P. Roccoberton, Jr., Stage Manager Tom Kosis, Technical Director Ed Weingart, Pat McCorkle of McCorkle Casting, Ltd., and Voice and Text Coaches Anthony Leathem and Jennifer Scapetis-Tycer. Finally, thank you always to Artistic Director Michael Bradford and Managing Director Matthew J. Pugliese for bringing engaging theatre to Connecticut and beyond. The voyage from the swamp to Duloc is just about over – whether you’re 4 or 104, join the motley crew of fairytale outcasts in Storrs, CT while you still can! I can’t tell you how many times I’ve used Shrek’s famous onion analogy in describing certain shows which are heavily nuanced with a lot of layers. (I’m sure my better half and Pillow Talking co-reviewer can tell you since she often points it out when she edits my reviews.) But this IS one time when it is hands-down, spot-on appropriate. 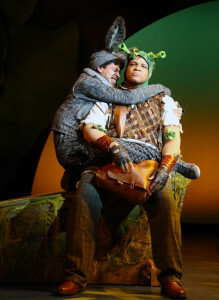 Connecticut Repertory Theatre’s (CRT) Shrek The Musical is exactly like Shrek’s onion analogy: finely nuanced and multi-layered. In a word, it was tour de force (okay, that’s three but it’s French). Who needs voice-over animated avatars of Michael Myers, Eddie Murphy, Cameron Diaz, and John Lithgow when you have talents like Will Mann, Scott Redmond, Desi Oakley and Mark Boyett in the flesh? The casting was – like Donkey says – a [perfect] parfait and everyone likes parfait. All of the aforementioned principals (three of whom are Equity) were simply outstanding. Spatial limitations and the threat of carpal tunnel syndrome prevents me from mentioning every single actor – and that is a crime in and of itself because the entire ensemble down to the Rats and the Three Blind Mice were a dream team. It’s hard to believe that anyone at any age is unfamiliar with the lovable green ogre named Shrek. (It started as a 1990 book by William Steig, was adapted into a film by DreamWorks in 2001, and was made into a musical in 2008 with music by Jeanine Tesori and book and lyrics by David Lindsay-Abaire.) The story is completely derivative and incorporates the best elements of different genres. First, it’s based on fairy tales that have been embedded in our collective unconsciousness long before we were born: The Three Little Pigs, Snow White and the Seven Dwarfs, Humpty Dumpty, and countless others. Shrek and Donkey’s relationship exhibits the best parts of a classic buddy story: think Eddie Murphy and Nick Nolte in 48 Hours or Paul Newman and Robert Redford in Butch Cassidy and the Sundance Kid or The Sting. The snarky-at-first-morphing-into-true-love relationship between Shrek and Princess Fiona smacks of classic film romances like When Harry Met Sally. Mounting a play like Shrek is a Herculean task. It has a plethora of moving parts: a musical, an orchestra, choreography, special costumes and make-up, a super large cast, elaborate sets and quick transitions. Add to that the complication of puppetry (it’s a good thing CRT has an MFA in puppetry) and you have one Shrek-sized production to pull off. And CRT pulled it off successfully making it all seem so incredibly easy. Speaking of puppetry, special shout-outs must go to the puppeteers who made their puppets come to life: Ed Ho, Sam Kebede, Nic Parks, Matthew Sorenson, and Noel Williams. 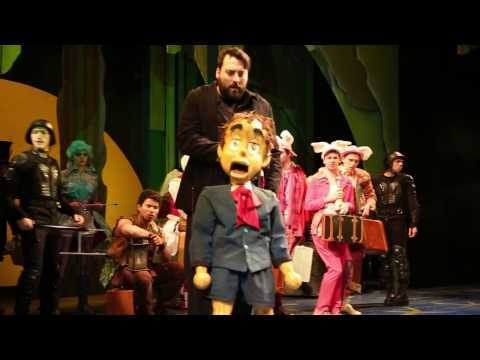 While all theatre is a collaborative process, the execution of a show like Shrek relies exclusively on each part working in complete synchronicity. Kudos must go to a positively awesome cast and crew, not one weak link anywhere to be found. I always am amazed at the professionalism and perfection that CRT achieves with every one of its productions – productions which are made up of mostly students with varying degrees of experience and a few seasoned professionals. The only drawback to CRT’s Shrek The Musical is its limited 10-day (virtually two weekends) run. More people need to see and experience this great show! Don’t be a stubborn ogre. Get out of your mud hole and see it before it closes.